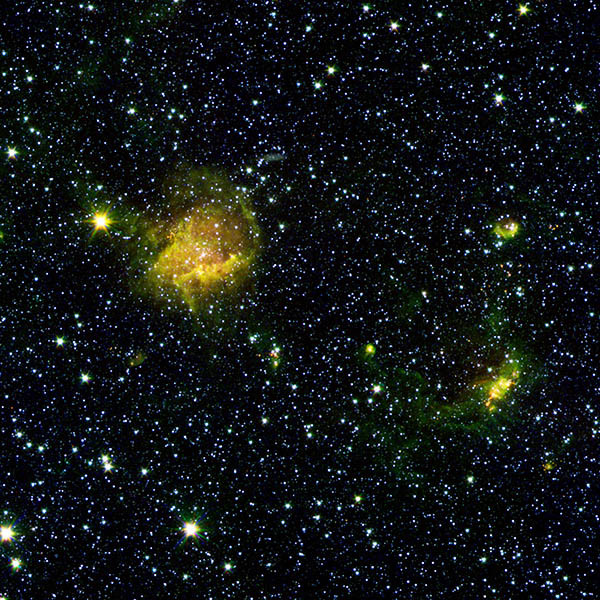 The GLIMPSE survey was performed using the Spitzer Space Telescope. The telescope was pointed to 111,000 different positions on the sky and snapshots were taken in four different infrared wavelengths (3.6, 4.5, 5.8, and 8 um; about 10 times longer wavelength than visible light), creating a total of 444,000 images. The MIPSGAL survey followed up with another approximately 400,000 images at 24 and 70 um. At visible wavelengths, we can only see about 5% of the way through the Galaxy on average, due to the opaqueness of the dust particles distributed throughout the Galaxy. In the infrared, not only are these dust particles less opaque, but the heated dust radiates infrared radiation, announcing its presence to our cameras. These surveys have 100 times the sensitivity and over 10 times the resolution of previous infrared surveys, allowing us to see stars and dusty objects throughout most of the Galaxy for the first time. The GLIMPSE and MIPSGAL images were stitched together into a large mosaic that spans about 180 x 2.75 feet at full resolution (390,000 x 6000 pixels)! A full-size banner of this image was unveiled on June 3 at the American Astronomical Society meeting in St. Louis. The images below show the survey area split up into five panels stacked on top of each other for easier viewing. The Galactic center is at the center of the image. These can be downloaded for poster-size printing (48"x36"). The first image displays the GLIMPSE wavelengths (3.6 - 8 um) in the familiar blue-green-red that our eyes see, with the shortest wavelengths displayed in blue and the longest in red. The second image shows GLIMPSE+MIPSGAL 24 um in blue-green-red also. Note here the 24 um is shown in red and the 8 um in green with the shorter GLIMPSE wavelengths in blue. Note that the images shown here, even at poster-size, are still scaled-down from the original. To see them at full resolution, these images are best viewed in the zoomable web browser developed by James Harold and Evaldas Vidugiri at the Space Science Institute. There you can see interesting features at size scales ranging from solar system size (less than 1 light year) to Galactic scales (100,000 light years in diameter). The viewer was made possible through an education supplement by NASA's Science Mission Directorate. The viewer will ultimately be made available in both Spanish and English for display in science centers and libraries. The different colors in the images highlight different physical processes. 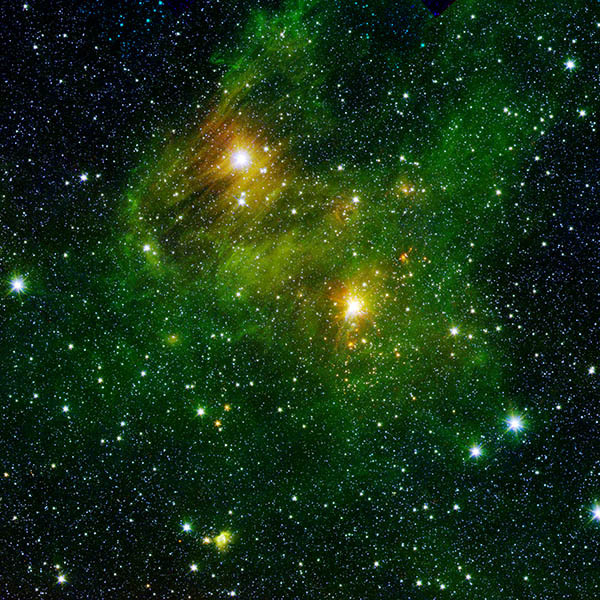 The GLIMPSE 8 um wavelength shows emission from Polycyclic Aromatic Hydrocarbons (PAHs), which are small molecules excited by strong ultraviolet radiation from massive hot stars. These molecules exist in the surface layers of dense molecular clouds. So this PAH emission is a signpost of recent high-mass star formation, which requires molecular clouds to form in. In the GLIMPSE survey, these high-mass star formation regions are lit up like fireworks, announcing their existence. Other physical processes highlighted in the different colors are ionized and shocked gas at 4.5 um. This shows up in green in the GLIMPSE color display. The ionized gas also arises in high-mass star formation regions, and the shocked emission arises in Supernovae remnants and also in very young massive stars in their earliest stages of star formation. These can be seen in zoomed in regions of web browser, as these are much smaller features than the large-scale PAH emission. All of the wavelengths show thermal emission, which arises mostly in dust of various temperatures (30-1600 K). The cooler the dust, the longer the wavelength it radiates at. Usually these observations need to be combined with radiation transfer models (e.g., Whitney et al. 2003a, b, 2004b) which calculate the flux at different wavelengths from dust at a range of temperatures, as you would see in a forming star surrounded by a disk or envelope of gas and dust. 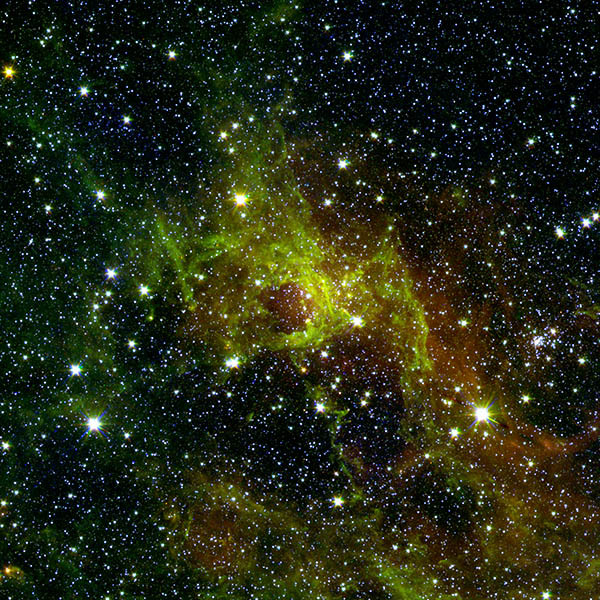 The MIPSGAL image highlights the youngest forming stars in red. We have cataloged over 72 million stars in the GLIMPSE survey (over 100 million including the GLIMPSE3D survey). For more information about how to obtain the GLIMPSE source lists and images from the Spitzer Science Center or the Infrared Science Archive (IRSA), click here). 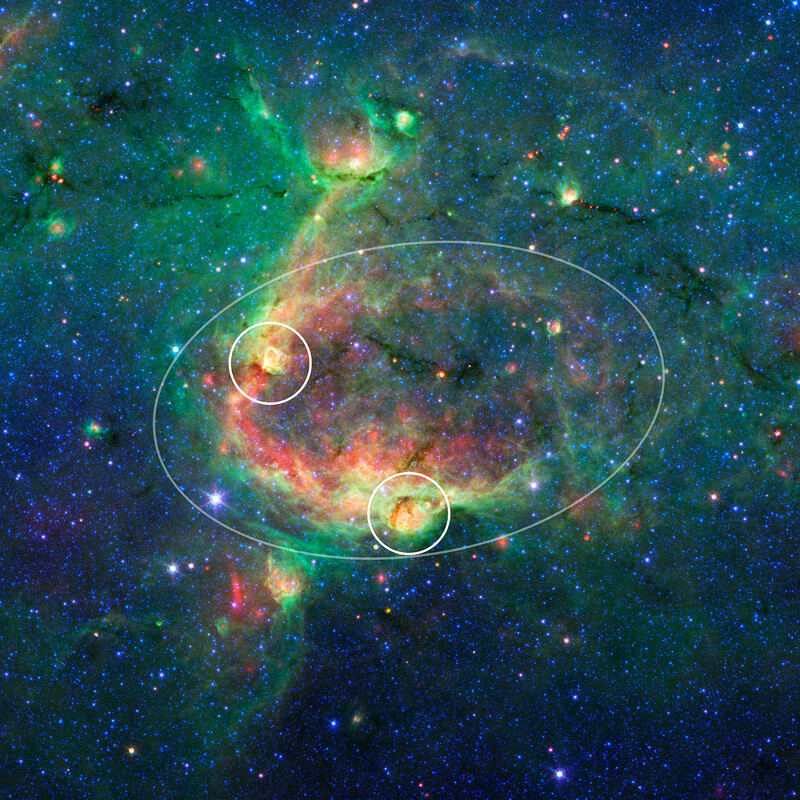 These have been used to identify the structure of the central bar in our Galaxy (Benjamin et al. 2005) and the spiral arm structure (Benjamin et al., in preparation), since we can see further through the Galaxy than ever before. We have also cataloged over 20,000 "red" sources, consisting of about 75% newly forming stars and 25% evolved stars (Robitaille et al. 2008); 591 PAH bubbles formed by the stellar winds of massive stars (Churchwell et al. 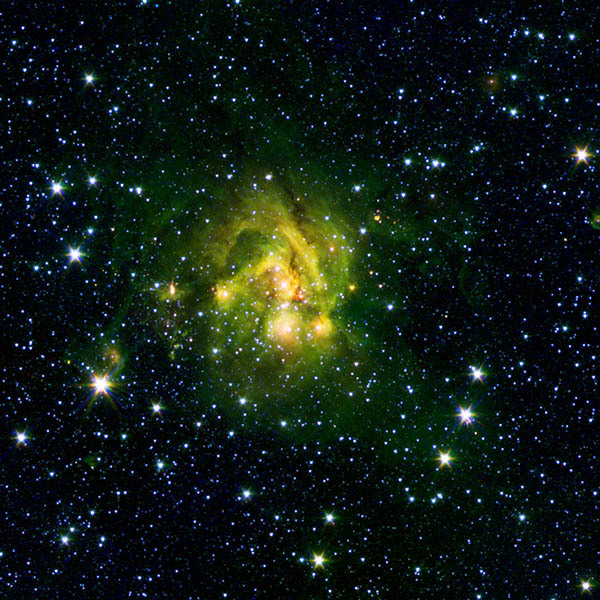 2006, 2007); over 500 variable stars (Robitaille et al. 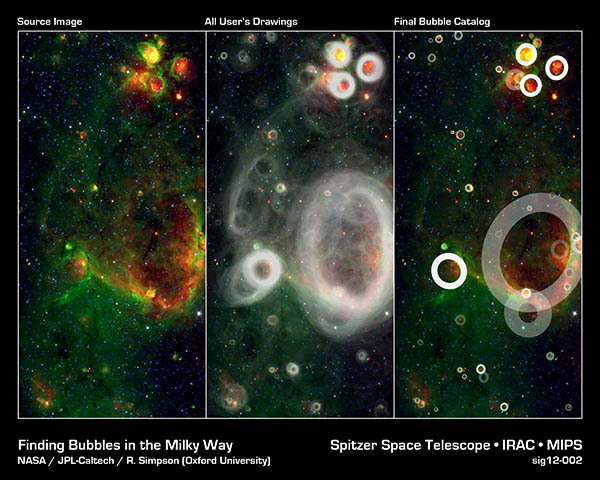 2007b); over 300 outflows from newly forming massive stars (Cyganowski et al. 2008); and 59 new star clusters (Mercer et al. 2005). 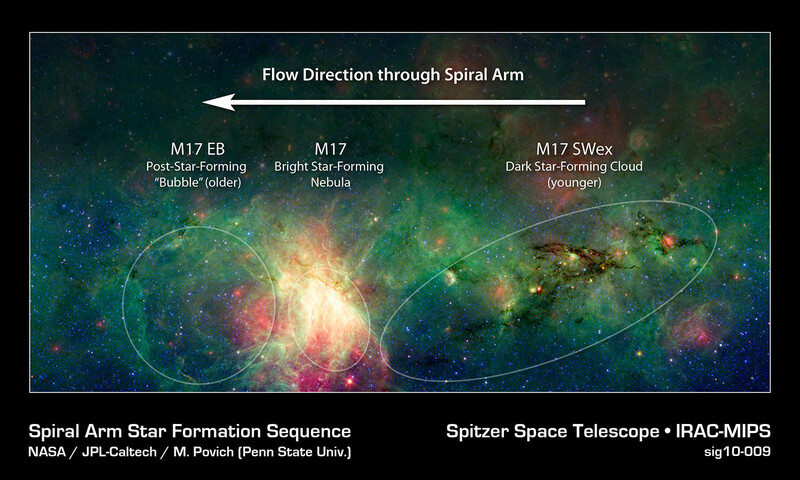 We have studied in detail several individual star forming regions (Whitney et al. 2004a, Shepherd et al. 2007, Watson et al. 2008, Povich et al. 2007, 2008); discovered a globular cluster (Kobulnicky et al. 2005) and a new planetary nebula ( Cohen et al. 2005); and determined a new infrared dust extinction law for the Galaxy (Indebetouw et al. 2005). One of the main goals of this project is to determine the Star Formation Rate of the Galaxy by actually counting the number of newly forming stars, viewed in unprecedented detail and sensitivity. We have developed modeling tools to aid in this monumental task, which include a large grid of 200,000 Spectral Energy Distributions of forming stars (Robitaille et al. 2006, 2007a, Whitney et al. 2003a, b, 2004b); see www.astro.wisc.edu/protostars). These are being used to analyze individual star forming regions and to produce a Galaxy-wide model of star formation to compare to our red-source catalog. These are just some of the results produced by our team. Because this is a legacy project, the data products (Catalogs and images) are publicly available. Other groups have produced numerous scientific papers (757 as of August 4, 2015) using the GLIMPSE data.